When the beautiful Harles from SVPR got in touch with me and asked if I wanted to review some products from some cruelty-free vegan brands they're working with I was so happy! When my parcel from them arrived containing some awesome stuff the first thing I started using (literally like right away) was Khadi's Face and Body Oil*. Since then I've pretty much been using it every day so wanted to share my thoughts with you all. Khadi's Face and Body Oil is a daily after shower body oil to keep skin moisturised and free from dryness with oils and herbs to reduce heat and inflammation - perfect for someone with rheumatoid arthritis like me. Sensitive skin has to be kept cool to prevent rashes, hot flushes and breakouts. No oils or herbs should increase heat in the skin and no photo-toxic essential oils to be used. 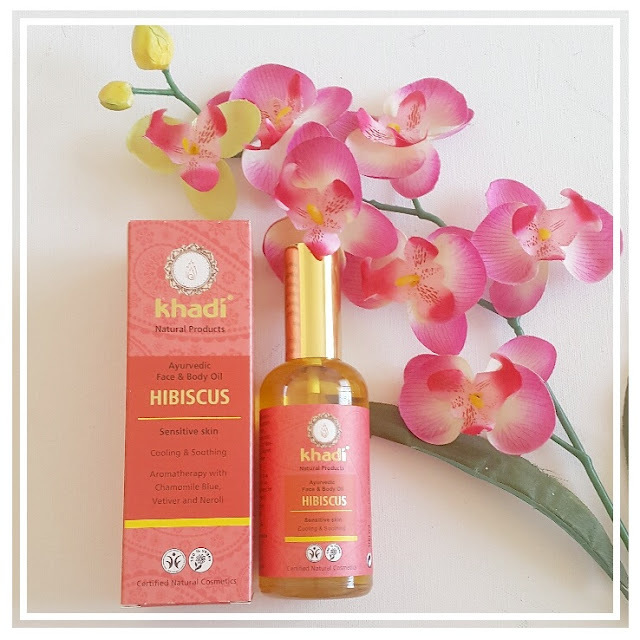 With hibiscus flowers to calm and soothe, increase skin elasticity and flexibility, and also help skin regeneration Khadi's Face and Body Oil* does it all. It's anantmool relieves burning sensation of the skin and improves complexion, and it's sandalwood cools sensitive skin while adding glow. And the vetiver balances sebum production and helps to moisturise, with lajjlu regulating sebum production and keeps skin cool. The beautiful chamomile blue fragrance is highly soothing and one of the most potent anti-inflammatory essential oils, plus it has a strong sweetish warm herbaceous aroma which is so stunning. It is extremely beneficial for people with sensitive skin so I know Phil is going to be stealing some off this off me as he suffers with eczema and has really sensitive skin. The mint in this oil cools down the skin and prevents rashes with its cooling aroma - awesome for the summer time! Did I mention it also reduces wrinkles while nourishing the skin? Because of course it does! This oil has everything!! I've been using Khadi's Face and Body Oil* now for a few weeks and I adore it, I know once this bottle runs out I'll be buying one for myself. Not that you all need me to state it as you all know if it wasn't I wouldn't use it but I do want to add that this whole band is cruelty-free and vegan!! AMAZING. If you'd like to check out this product or more from this brand then click here to visit their website. Loving body oils at the moment too, super moisturising - sounds like a great CF product! Your photography for this post is absolutely beautiful! I've never really used a body oil, as I always worry that it's going to leave me greasy 😂, but this one sounds good! This sounds like such a great product, body oil is something I rarely use but I should change that! The packaging of this is gorgeous! Chamomile is one of my favourite fragrances so this would be right up my street! I always love reading your product reviews because I know that everything will be cruelty free and that I'd be able to purchase what you recommend without inflicting any unnecessary suffering! I love body oils. Literally, they're my current obsession! Definitely sounds like I need to try this!